Instant Messaging has quickly become one of the most popular ways to communicate with those near and far. There are many different instant messaging services that you can use to exchange and share. We have collected some of the best messaging add-ons so that you can connect with others easily and efficiently. HyperIM is a great messaging add-on if you are online simultaneously in many clients. This status manager works with Google Talk, Yahoo Messenger, Windows Live Messenger and Skype. This messaging add-on works as a status manager using macros and variables to set the status. If you are listening to music, HyperIM will list the songs that are being played over all of your instant messengers. This allows you to share your musical likes with your friends. There are a great assortment of plugins available for HyperIM depending on your own personal preferences and needs. There’s a plugin that uses uTorrent which can showcase your uploading and downloading amoung your instant messaging friends. HyperIM is available as a free download from many different websites. 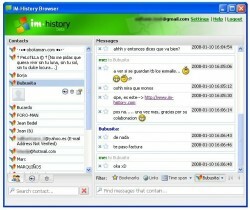 IM History is a very useful tool for archiving your chats across multiple instant messengers online so that you can access them anywhere. This tool can help to refresh your memory of certain personal and business conversations. It is also good if you get directions and phone numbers through instant messengers and need access to it while on your mobile. IM History is available to download for free from a wide variety of sites including www.im-history.com. 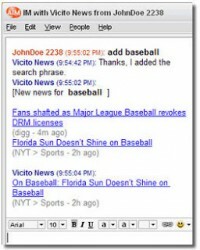 Vicito is a neat plug in for those who want to stay updated on the world around them. It delivers the most recent current news updates to your instant messenger. All you have to do is add Vicito ID to your Instant Messenger buddy list. It will then search through the keywords that you select. You can also specify how frequently you would like it to check for updates. Keywords can include politics, celebrity names, weather, and more. 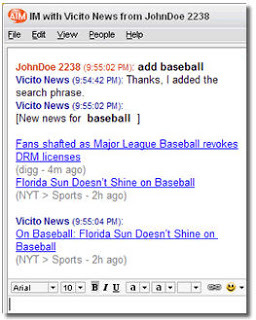 Vicito provides you with personalized new aggregation via your instant messenger. It is available for free at many different websites. 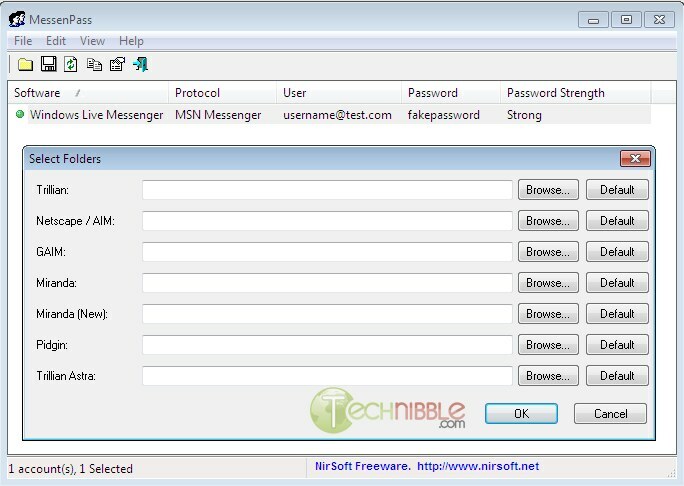 MessenPass is a great master password instant messaging add-on that can save the day. If you happen to forget your password to one of your instant messenger accounts you can recover it through MessenPass. This add-on works with most popular IM clients and can even extract IM passwords of the messenger service that is currently logged in on another computer. MessenPass should only be installed if you have tough to crack passwords though otherwise the wrong person could end up reading your private chat histories. MessenPass is available as a free download on many websites. FeedCrier is a great add on that allows you to set up notification alerts for your favorite feeds on your instant messenger. FeedCrier is very easy to add, all you have to do is select your instant messaging program, screen-name and enter the website that you want to receive alerts from. 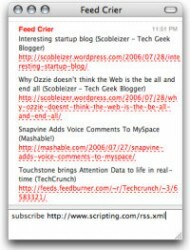 The RSS feeds are delivered in real time. You do not have to sign up or register using your email address. 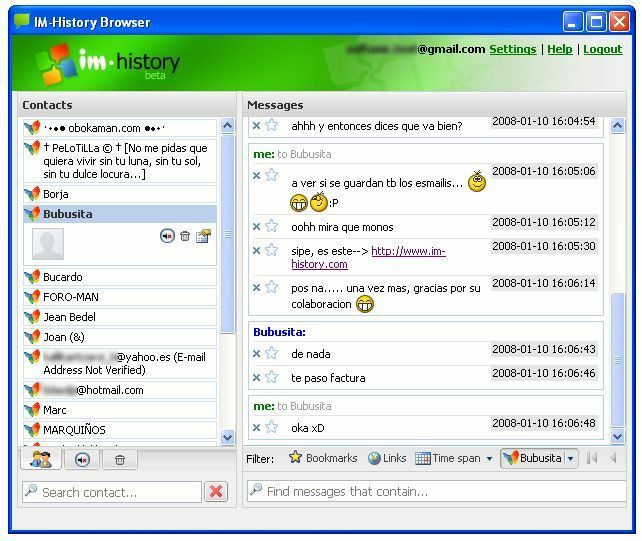 It is supported on the following Instant Messaging Clients: AIM, MSN Messenger, and GTalk. It is a free service so you may see pop-ups once in a while. 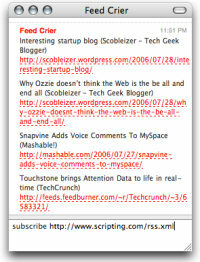 You can download FeedCrier at many different websites. Instant messaging add-ons can keep you up-to-date and connected with the world around you. Instant messaging add-ons make your web browsing experience come to you, making you more efficient on the web and always current. If you find that you spend a lot of time on your instant messaging service why not utilize these extensions to make the web come to you.